Today we’d like to introduce you to Sean Sparks. Sean Sparks is the owner and operator of Float Away Spa in Highland Village, TX. Sean grew up in Plano, Texas and has lived in the North Texas area his entire life. He has been involved with the health and fitness industry since 1999. Sean practiced martial arts for 10 years, earning a 3rd Degree Black Belt. It was through martial arts that Sean gained an understanding for meditation. In 1999, Sean became a Certified Personal Trainer through The National Academy of Sports Medicine (NASM) and The National Strength and Conditioning Association (NSCA). He continued his training with NASM going through various specialty courses, such as the Performance Enhancement Specialist, Sports Fitness Specialist, Integrated Flexibility Specialist, and Corrective Exercise Specialist. He has also earned certifications from The Gray Institute in 3DMAPS, as well as, a Certification in Applied Functional Sciences. Sean went to school for massage therapy at the Texas Massage Institute in Plano, graduating with honors in 2005. 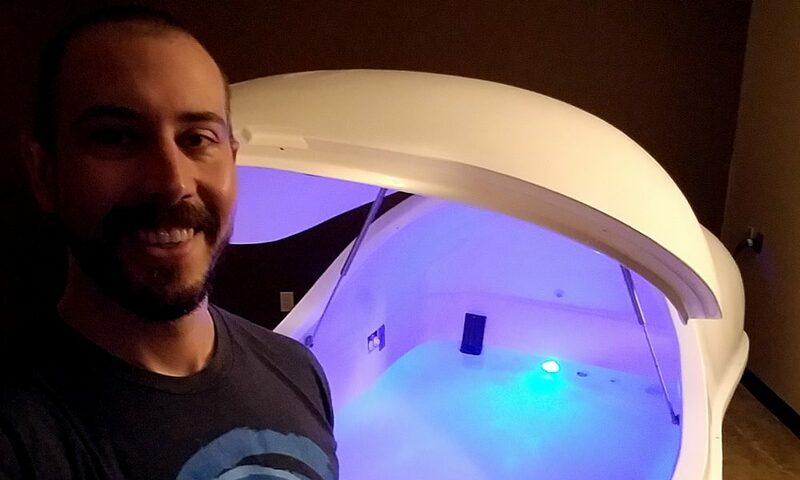 After Sean earned his massage therapy license, he took a 100-hour advanced course in deep tissue, as well as, continuing education courses in hot stone, prenatal, lymphatic drainage, and kinesio taping. Sean has since taken advanced coursework in Myoskeletal Alignment through Erik Dalton, earning a level 4 certification. He is currently working towards a certification as a Master Myoskeletal Alignment Therapist. Sean has also taken an advanced 40-hour course in Orthopedic Massage through James Waslaski and studied Anatomy Trains by Tom Myers. Sean first heard about flotation therapy while in massage school. Unfortunately, there weren’t any places to float nearby at that time. Sean was introduced to CrossFit in 2006. He became a CrossFit Level 1 Trainer and took specialty courses in Olympic weightlifting, endurance, and gymnastics. In 2009, Sean opened CrossFit NTX in a small 600 sq. ft. facility behind he square in Denton, TX. Less than a year later, the gym grew into a 5000-sq. ft. warehouse facility. Sean owned and operated the gym for five years. During the last year, some transitions happened that left him regularly getting four to five hours of sleep at night with a nap in the middle of the day between clients. He was running the gym by himself, working early mornings and late evenings. It was during this time that Sean had his first float experience and it was quite profound to say the least. The float tank allowed him to physically relax and slip into a meditative state. This was by far the most relaxed he had ever been in his life. Sean knew immediately after his first float that he should look into opening a float business. He decided to sell the gym in order to open Float Away Spa a short time later. Sean currently owns and operates Float Away Spa in Highland Village, TX. He eventually wants bring on a few employees that can work the front desk and facilitate floats while he continues working with massage clients. Sean plans to expand Float Away Spa in Highland Village or open another spa in the coming years. It has been an extremely rocky road to get to this point. It was a very tough decision to sell the gym that I had spent the last five years building from the ground up. The hardest thing was parting from my members. There were many things that had to fall into place for the transition to happen. My lease was on a month to month basis at this point. I didn’t want to leave my landlord and close the doors on my members with a moment’s notice. Instead, I approached another CrossFit owner that was in town to discuss the possibility of them taking over my equipment, location, and membership. I knew that they were growing and looking to expand soon. We had similar coaching philosophies, and I felt like they would be a good fit. I had someone teaching martial arts a few days a week and wanted to make sure they had a location to continue their classes. Luckily, the CrossFit owner that purchased the gym from me also teaches martial arts at dojo nearby. He was kind enough to make space at his dojo for the martial arts teacher that was teaching out of my gym. With the gym situation looking like it will work out, I proceeded to find a location for the spa. After signing a lease, I was able to get financing set up for three pods. I had also purchased three zero gravity massage chairs. Then, the situation took a turn. The financing company on the pods came back after paperwork was signed and deposits were sent in to let me know that they had decided to drop my financing because they didn’t realize that I was a startup business. Now, I was suddenly stuck in a five-year lease without the equipment needed to run the main part of my business. Lucky for me, my parents decided to invest in my business. They purchased two pods and were instrumental in helping with the cost of my build out. We spent the next several months working on plans with a contractor, engineer, and architect. I thought that I would have time to work for another business doing massage therapy during this process in order to keep a stream of income, but my days became consumed with working out the details of my new float business. I designed the floor plan and worked with an architect to make sure it was ADA compliant. The final floor plan literally took up every inch of space. There would be a lobby in the front, a relaxation room for the zero gravity massage chairs, three float rooms, two restrooms, as well as, a mop/sink, electrical, and laundry/storage room. There were a few surprises that we were not anticipating. We had to add a new HVAC unit and there was an automatic sliding door that needed to be changed out for a regular door. The planning stage came to a halt for a few months as the end of the year approached. It seemed like no one wanted to work and it became extremely difficult to keep the process moving along. The process picked up again after the beginning of the year. With all the plans in place, we were ready for the demolition and construction phase. My investors almost pulled the plug on demolition day, but changed their minds after hearing that demolition had already begun. That was another moment that I felt like this whole process was going to crumble. Thankfully, the dream continued. Altogether, it took about nine months to complete the planning and build out. About three years before the spa, my dad took a fall from some stairs hitting his head on the tile in the kitchen resulting in a brain bleed. He had a stroke during the first week, developed pneumonia, and had to be intubated. He spent several months in ICU and rehabilitation centers going through the recovery process of learning how to walk and talk again. These medical issues would continue. In fact, he was recovering from a quadruple bypass surgery during the grand opening of Float Away Spa. A few months later, he fell and broke his fibula. After surgery, the wound didn’t heal properly and he developed sepsis. During this period of transition from selling the gym and starting a new business, I would spend several hours a week at the hospital with my dad. My mom started having severe anxiety and panic attacks from the stress of taking care of my dad. Once one of them got better, the other would take a turn for the worse. Everything went smooth during the construction phase. The city was great to work with and we didn’t have any issues with inspections. All of the contractors and subcontractors did an outstanding job! On June 18, 2015, Float Away Spa opened for business. After being open for a few weeks, I received a threatening e-mail from another business in the float industry. They were upset that we had similar names and considered legal action. I spoke with a few attorneys, and we were eventually able to come to an agreement. There have been several times that it didn’t look like this business was going to happen. I have spent quite a bit of time trying to help take care of my parents. There have been unexpected costs and hold ups, but perseverance has keep the dream alive. Float Away Spa offers state of the art flotation and massage therapy. We are known for providing a place where people can let go of their stress and worry. The Float Pod creates an environment that restricts outside stimuli. The water contains about 1200# of Epsom salt that is heated to the same temperature as the skin. It allows the client to recognize areas of tension and let them go. It is usually very easy to physically relax in the pod. Sometimes it takes a few sessions to learn to calm the mind though. We use the zero gravity chairs as a tool to transition our clients from their drive. This gives them an opportunity to calm down a little bit before their float. Music and lights are available for the client if they choose for part or all of their float. We know that laying down in water in silence and darkness for an hour or longer can seem overwhelming to some people. We try to create a setting that allows our clients to have quite possibly the most relaxing experience they have ever had. We give our clients enough information so that they are comfortable with the process without “programming” them on what they could experience in the pod. Sean Sparks, the owner, is a certified personal trainer and licensed massage therapist. He specializes in mobility and orthopedic massage. Whether you are recovering from an injury or want to enhance your athletic game, we have the experience and expertise to set you on the right path! If you are just looking for some stress relief and a place to relax your body and mind, we can help you with that, as well. I was very active as a kid. I was involved in a variety of sports. such as soccer, baseball, basketball, street hockey, and I was even on a bowling league for several years. I played football and ran track in middle school, as well as, played the trumpet. I also began martial arts in middle school. My dad and I got certified and became avid scuba divers. I have probably done somewhere between 300-350 dives. In high school, I was on the wrestling team for a year and only lost one match. Martial arts would become a daily part of my life for about ten years until I moved to Denton. I eventually earned a 3rd Degree Black Belt.